However well we plan, life has a habit of throwing unexpected curve balls. We can’t stop getting knocked down, but we can get back up. 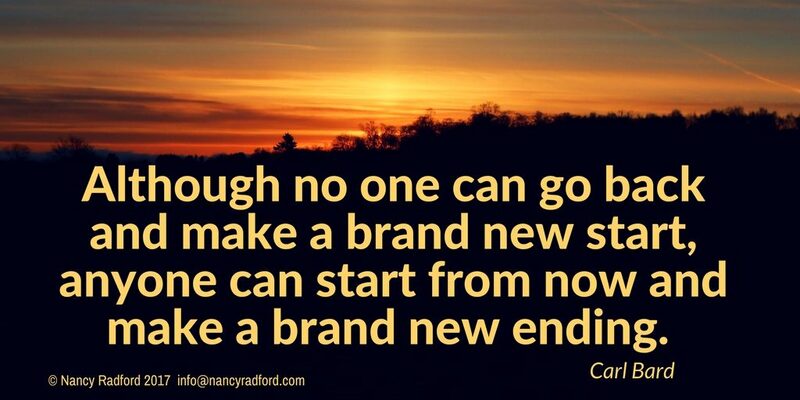 We can’t make a brand new start, but we can start now and make a brand new ending. What do we do when we’re knocked down? Or how do we try and help others? Usually, one of three things, none of which help us or anyone else get back up. Whether we blame ourselves or others, it is rarely helpful. Stuck in the past, we go over and over what went wrong. We are so lost in resentment and anger that we can’t see the way out. We think that if we admit things are wrong, they will get worse. Or we think if we ignore a problem, it will go away. We bury the problem deep down and beat ourselves up for worrying. 3. We do a PollyAnna and try to find the good in every situation. While trying to find a silver lining can be helpful a little further down the line, as a first reaction it can derail efforts, as it does not acknowledge our hurt or need to heal. As Brené Brown so clearly shows in the clip above, empathy is better than sympathy. We need to acknowledge the pain and loss before healing can start. Seeing others in pain hurts, yet ignoring or turning away from the pain makes it even worse. Research has shown that naming a feeling lessens the impact of that feeling and that simply having someone with you can reduce pain. So don’t beat yourself up for feeling down. Write down your feelings or pour them out to a good listener. If you want to help someone get back up, don’t start by telling them not to feel down. We often feel helpless in the face of loss, whether our own or others. This is when compassion and kindness can make an enormous difference. Tammy Lenski writes movingly of how to help people in pain with small acts of caring. Reaching out and connecting with an act of kindness can have a massive impact. If you are stuck for ideas on what to do, have a look at the Random Acts of Kindness website. Even a brief conversation can make a difference. A recent Samaritan’s campaign shows the power of small talk. Knocked down? Show yourself compassion and kindness. Don’t blame yourself, encourage yourself, find small ways of being kind to yourself. In times of crisis, it is even more important to make sure that you “keep your sails” full. If you are the one knocked down, don’t hesitate to ask for help. If you are the one who wants to help, ask for help to understand how you best you can help. And if things are good, build resources for the hard times. If you are sailing into the wind and the dark and want some help with keeping your boat steady and your sails full, get in touch with me for a free confidential chat. +44 7980 980 078 or email help@nancyradford.com for a secure video conversation. Nancy Radford on Won’t Pay or Can’t Pay?